PROMISE MISSION STATEMENT: To help Buchanan graduates achieve their dreams by supporting post-secondary success. PROMISE VISION STATEMENT: Enriching Buchanan to be a community of choice to live & educate one's children. We are excited to share the Foundation's 40th Anniversary video with you! 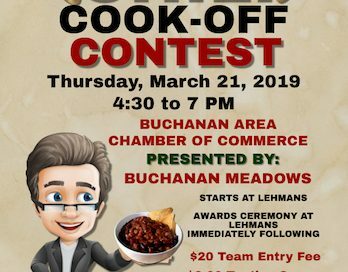 After you purchase your spoon at Lehman's, stop by and taste Rob's Three Bean Chili! 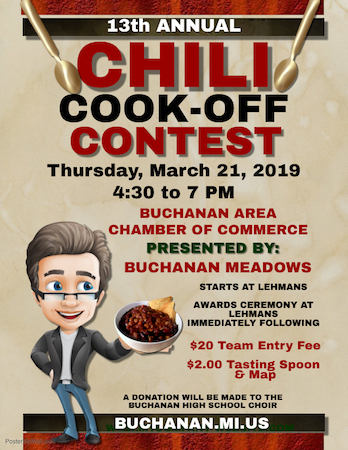 By jayne lamb|2019-03-21T18:38:19+00:00March 21st, 2019|Categories: General|Comments Off on We are participating in Buchanan’s 13th Annual Chili Cook-Off Tonight. Be sure register in AwardSpring by clicking "2019 Grads Apply Here" above. Seniors who apply before Winter Break will be entered into a drawing for a $100 Amazon Gift Card. By jayne lamb|2019-02-15T20:36:37+00:00November 21st, 2018|Categories: General|Comments Off on 2019 Seniors apply for the Buchanan Promise before Winter Break! By jayne lamb|2019-02-15T20:36:37+00:00November 1st, 2018|Categories: General|Comments Off on Look for the Buchanan Promise table at Middle School & Ottawa conferences next week. CLICK HERE FOR EXCITING K2C INFO! By Randy Hendrixson|2019-02-15T20:36:37+00:00October 19th, 2018|Categories: General|Comments Off on KICKSTART to CAREER is HERE! MGCF has been named beneficiary of a multi-million dollar bequest to support a new scholarship program at Buchanan Community Schools. Modeled after the Kalamazoo Promise concept, it will be available to graduating students who reside inside the BCS district boundary. Length of residency will determine the percentage amount of the award, with students who have lived in district K-12 receiving 100% of the available grant, and others on a time of residency sliding scale. You must be enrolled at least 9th – 12th grade to be eligible. Each student is encouraged to complete the Federal Application for Federal Student Aid (FAFSA) and apply for at least one additional community based scholarship. Many colleges require FAFSA as part of their application process. No merit based criteria will be used for the Promise Scholarship. All students who are headed to a post-secondary institution, whether an associate’s, baccalaureate, trade or certification program, could be eligible. Federal and community scholarship grants should NOT affect student eligibility. The Buchanan Promise Coordinator will be available to answer student/parent questions at BHS during certain times of the school year. Watch this website and school emails for those dates and times. There is an appeal process available for students. Contact MGCF to inquire about that process. Every donation, large or small, supports our mission of transforming Buchanan by making a long term investment in education.